provide students with instant feedback on their progress. This quick guide to classroom voting by Derek Bruff (Vanderbilt University) suggests strategies for peer instruction, leading class wide discussion, and responding to student learning needs in the classroom. Staff must have an TurningPoint Instructor account so please enter your name and University email address below, and click the send button to email your details to TurningPoint. They will create your account and you will receive an automated email from TurningPoint (titled Verify Your Email Address) which contains an activation link. Clicking the link will allocate 350 seats to your TurningPoint account which will remain with your permanently and can be used whenever you are polling students. A copy of your request is sent to the IS Service Desk for our records and you can contact them should there be no response from TurningPoint. Students do not need a TurningPoint account and by default are not prompted to sign-in (but you can change this in your polling session). The two main ways are TurningPoint Web or the TurningPoint application (for PowerPoint), and both allows students to respond on their own devices. 1. You can use TurningPoint Web for simple polling by logging into http://instructor.turningtechnologies.eu. Create a course and then you can questions from the three types available types: MCQ, Numeric and Short Answer which is great if you want students to respond with sentences. Tell the students to type https://responseware.eu into their web browser and then give them the session ID and they’re ready to respond. View this Quick Guide to TurningPoint Web or the general help guides are here. 2. If you wish to use the handsets or embed your questions within PowerPoint then use the TurningPoint application which also lets you do more advanced polling such as comparing slides. The application is available on all staff computers and teaching rooms from the networked applications menu. To install TurningPoint on your laptop then download the application from the TurningPoint website. 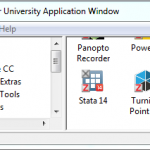 The TurningPoint website has quick guides, video tutorials and the full instructions for Windows and OSx computers. 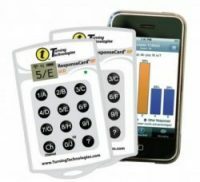 These cover polling with clicker handsets and also web polling (called ResponseWare).